1 2018-03-19T19:18:53+00:00 Liza Potts 2e4024b066fd3068a576ac52a252ea3d0f5ca650 1 1 The participatory memory space for Princess Diana at the Pont de l'Alma contains writings, artworks, and objects left by her fans and others. gallery 2018-03-19T19:18:53+00:00 Liza Potts 2e4024b066fd3068a576ac52a252ea3d0f5ca650 Engaging Harry Potter Through participatory memory making activities, participants establish their identity as Harry Potter fans. This section describes how Liza and her undergraduate researchers collected and analyzed their data. Scrolling through the images will allow the reader to have a better understanding of the kinds of memory writing fans created in this space. The audio describes the kinds of sounds expected when standing near a busy intersection in Paris and gives a sense of the frenetic activity near a memory space. This sound is based on the work of Freesound user Alcappuccino, which can be found here. Visiting this site multiple times over the course of 10 years, Liza worked to map this space, observed the participants, and attempted to understand the kinds of participation and the responses to that participation. 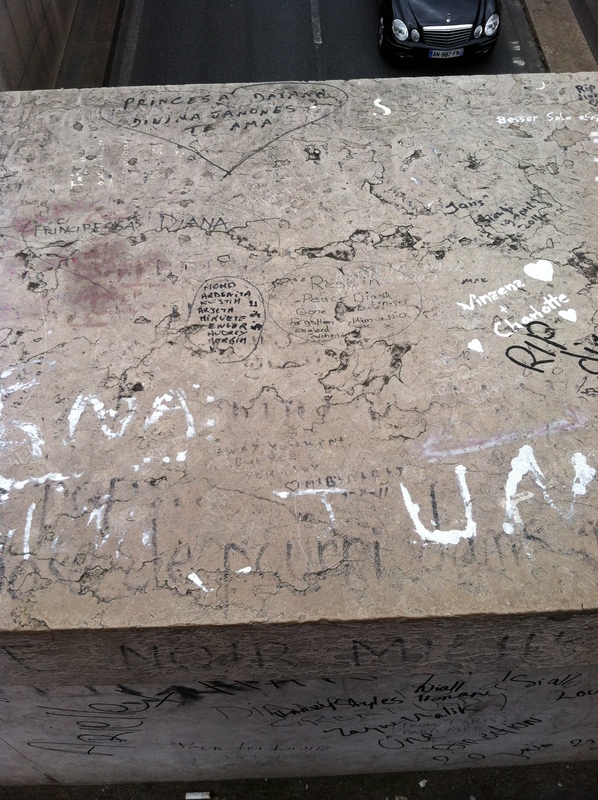 Although it would be years before Liza would pursue this project in earnest, this space sparked an interest in participatory memory due to the unique writing activities taking place here. 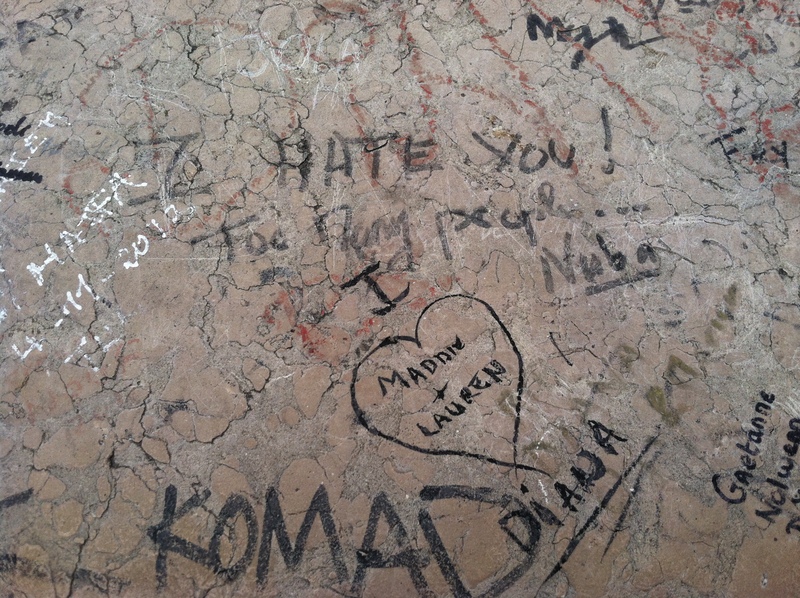 During the 2014 study abroad led by Liza, a student research team worked on site, experienced this space, collected data, and analyzed what they found. Throughout this phase of the project, undergraduate student researchers were a key part of data collection, analysis, and discussion. They learned about conducting ethical research in public spaces, read about the subject areas, traveled to the space, and applied Liza’s teachings to their research. Working with her undergraduate researchers, Liza discussed the strategies and tactics of the city of Paris and the fan participants. Giving the student researchers a more narrow view of Michel de Certeau’s (1984) discussion of strategies and tactics, Liza worked to oversimplify the issue at first. 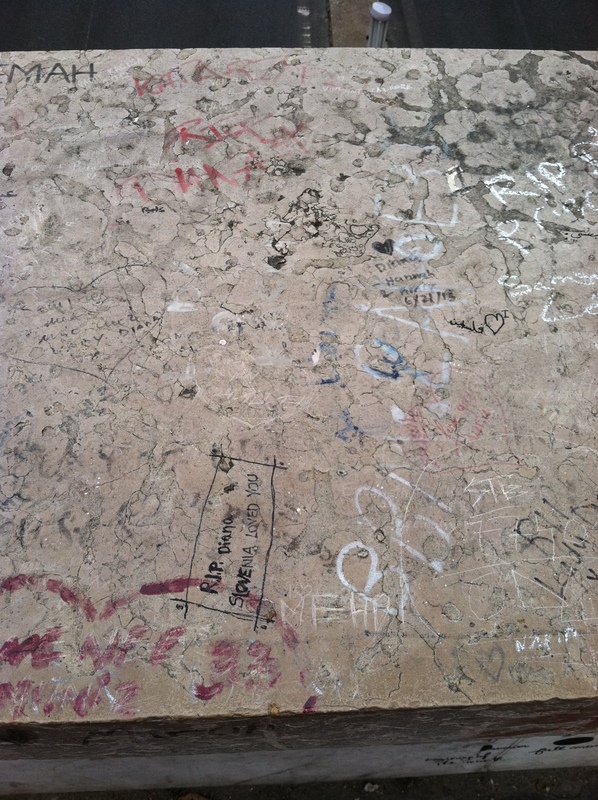 In this space, there are many participants overcome by emotion and wanting to express themselves through writing. 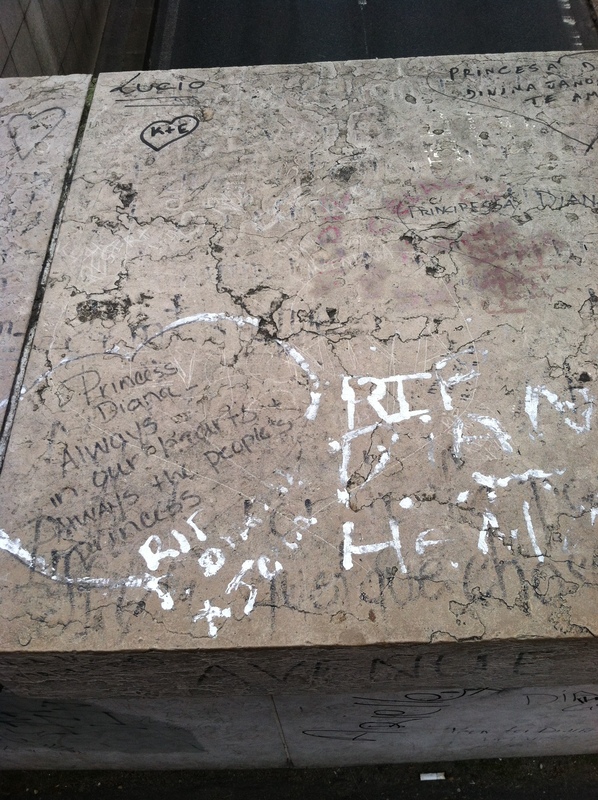 But the city wants to keep its spaces clean and considers this writing to be a nuisance– graffiti, even. How do the two groups work to gain agency over this space? 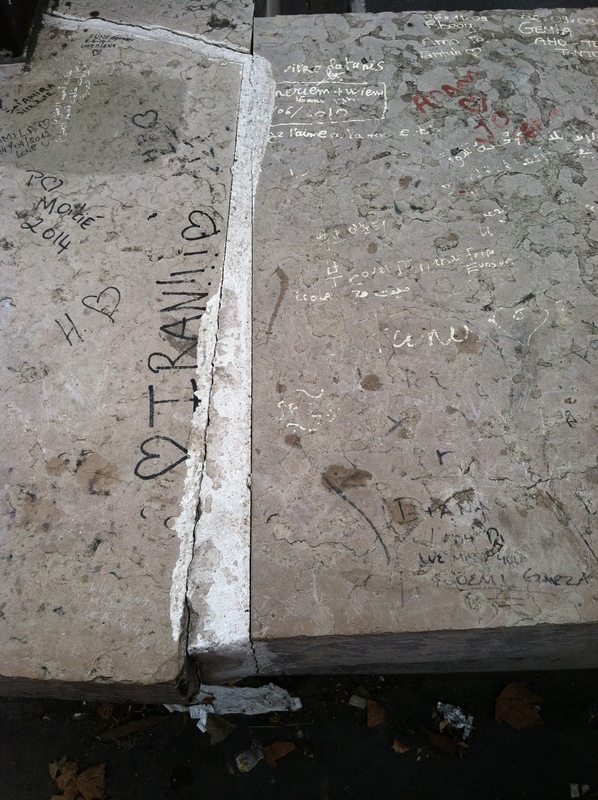 This binary opposition provided a way for students to understand what they were seeing and work through their short research trip to the site. To take a more nuanced approach for the purpose of this book, Liza and her undergraduate researchers took a deeper dive into de Certeau’s The Practice of Everyday Life. For de Certeau, organizations and corporations hold power with which they can execute long-term strategies. In contrast, when a tactic is deployed by those without this power, it is an “art of the weak” (p. 36-37). The strategy/tactic binary establishes corporations as owners of content and producers of knowledge, while everyday people are without both. People must instead attempt to operate under these conditions. The binary of strategies and tactics becomes more complicated in spaces of memory. When motives lead to groups talking past each other and where people’s participation and activism is more about flexibility and adapting to conditions, we can see a blurring between the two. It is also not so clear that these tactics are the art of the weak, especially when we see how long these spaces have endured. 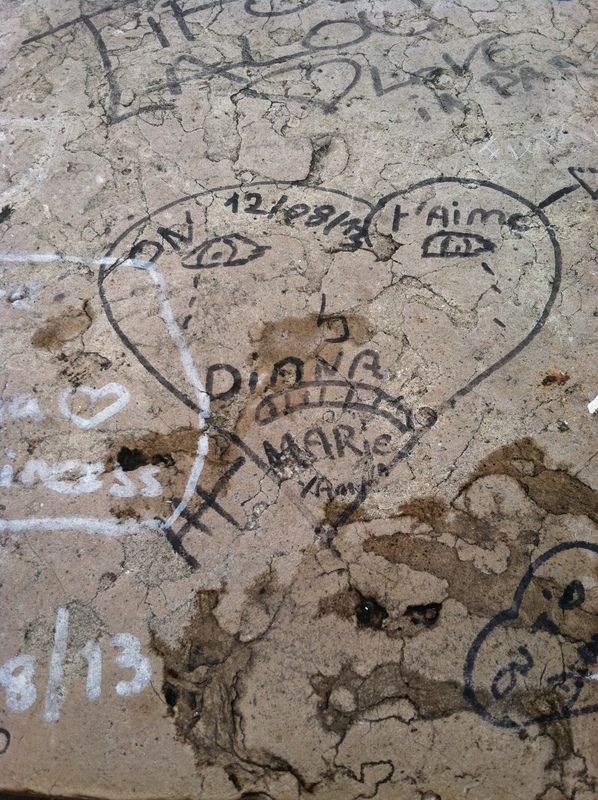 In the case of Princess Diana’s memorial, we saw a space where fans used writing to express their emotions and where the Parisian government sought to quiet the space by erasing it. 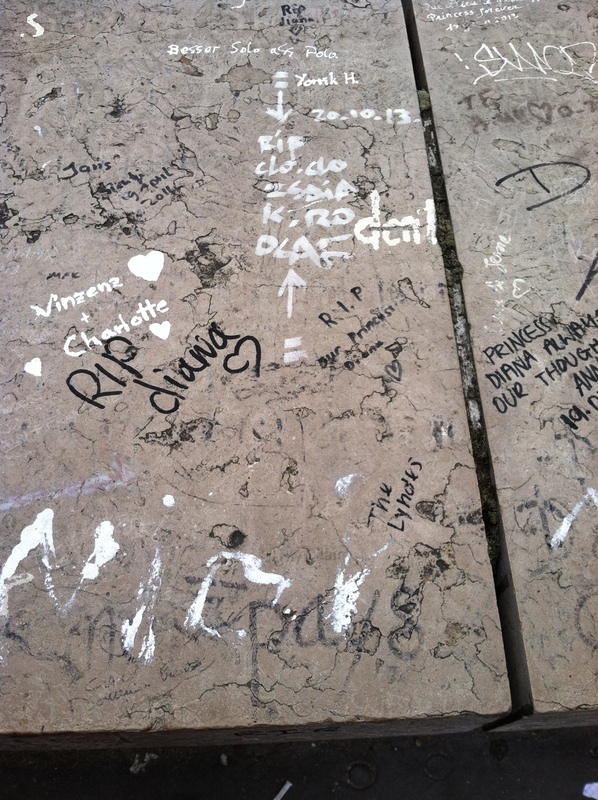 Although the space was surrounded by the cacophony of busy streets in Paris, the space itself was somber. 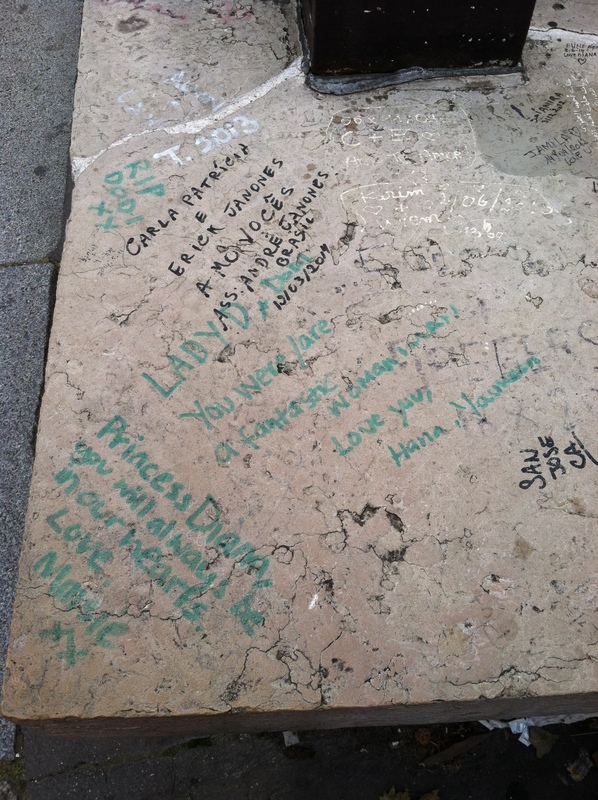 When we visited the space, Princess Diana’s fans were in attendance, leaving roses, tracing their fingers along the concrete, and reading messages left by other fans. Many people tend to spend their time here in quiet reflection. 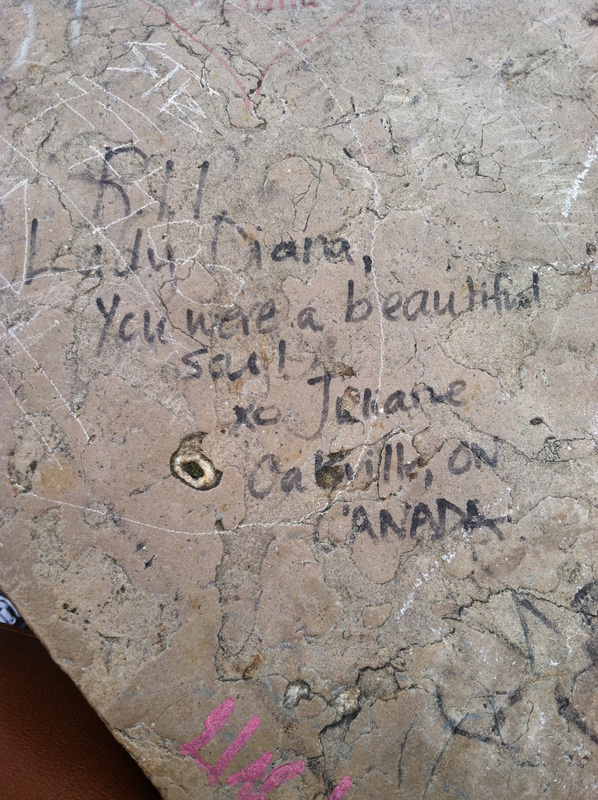 Some people write messages or leave objects such as roses behind. Therefore, we needed to be sensitive and ethical in how we collected our data and treat the space and the people with equal reverence and care. 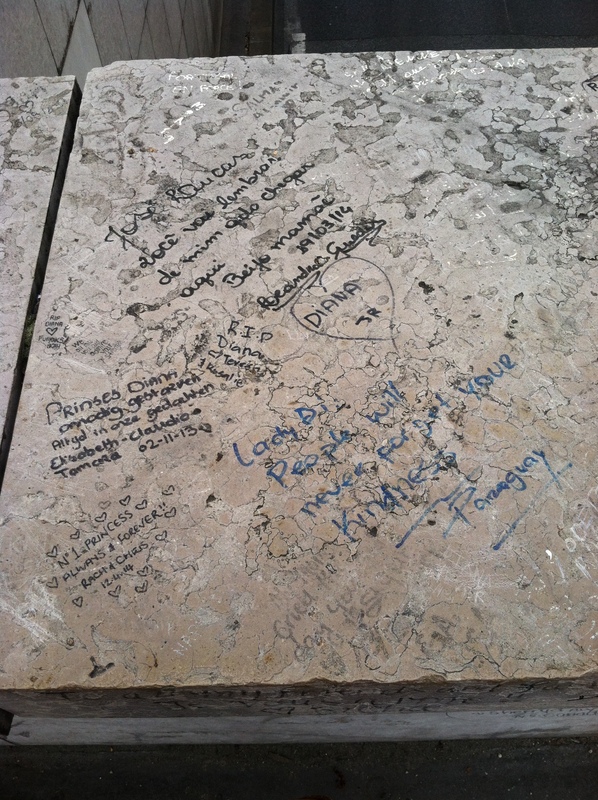 Similar to the moves made by Julia A. Bokser’s (2016) work on public memorials and feminist responsibility, Liza instructed the students to think about what this space means to the participants and to read their writings with an understanding of their community, regardless of whether or not they were personally invested in Princess Diana’s story. 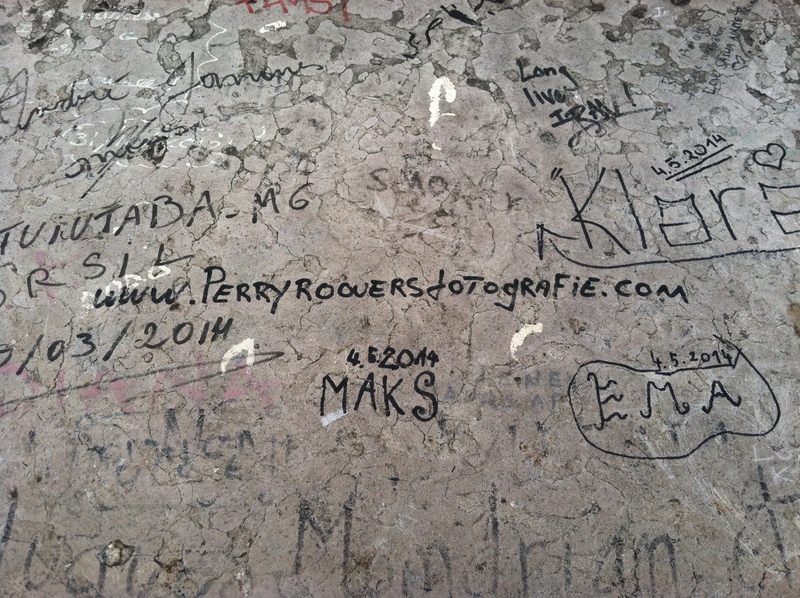 Students were instructed how to capture photographs of the writings and how to avoid photographing participants’ faces to protect their privacy in this space of memory. To plan their project, the students consulted with Liza about what she found in the past and how she coded the writings found in this space. They received a brief overview of the concepts of strategies and tactics earlier in London, so they had an understanding of how these spaces were operating when the fans and the government collided. Meeting ahead of time to work through their ideas, the students decided to take photos of each section of the space. They would later code this data using a collaborative spreadsheet in Google Sheets. 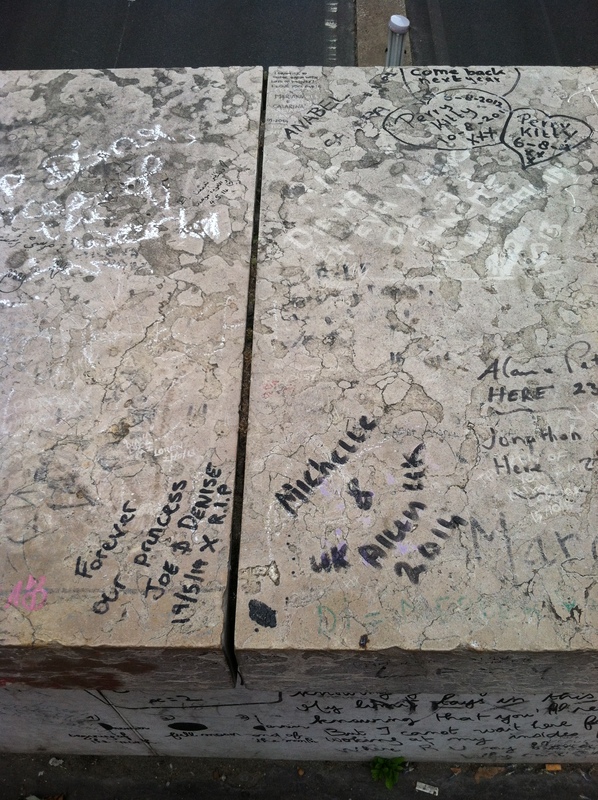 Starting from one side of the bridge and moving across to the other side, the students took close-up and side-by-side photos that nearly captured the full length of the ledge. They deposited 44 photos representing the top view of the space into Google Drive folders and began organizing them. The students then briefly described the photos and labeled each photo with a number. This kind of organization helped them keep track of their data and work together online. 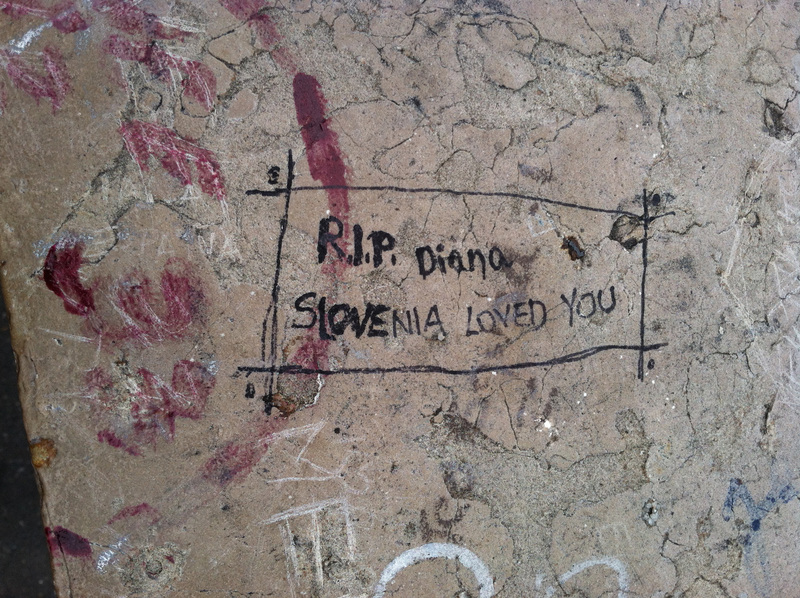 In describing the impromptu memorials created in London in the wake of Princess Diana’s death in 1997, memorial scholar Victor Jeleniewski Seidler (2013) noted that there was a “diversity of languages and spiritual traditions” and that “people did not feel they had to conform to a given standard of behavior” (p. 206). 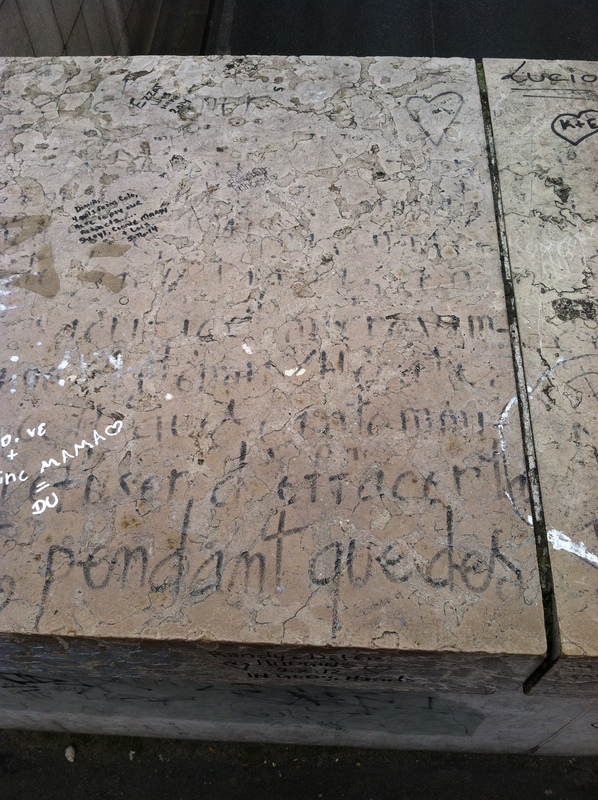 That is very much still in evidence at this space in Paris, where many peoples, languages, and arguments are combined through writing and drawing in this space. In fact, it recalls Kendall R. Phillips (2004) position that memory is not fixed and stabilized, but instead memory is living, dynamic, fluid, and contestable. In this space, there are many supporters of Princess Diana, but there are also speakers who are addressing other audiences entirely. And several who are creating new histories based on their feelings about the princess, various governments, and their own experiences. As we worked further through our data in preparation for this case study, we found Tammie M. Kennedy and Angelika L. Walker’s (2016) piece useful with regards to understanding what was at stake for the fans participating at this memorial. After cataloguing and analyzing the images, one of the most striking findings was the diversity of languages and countries represented. 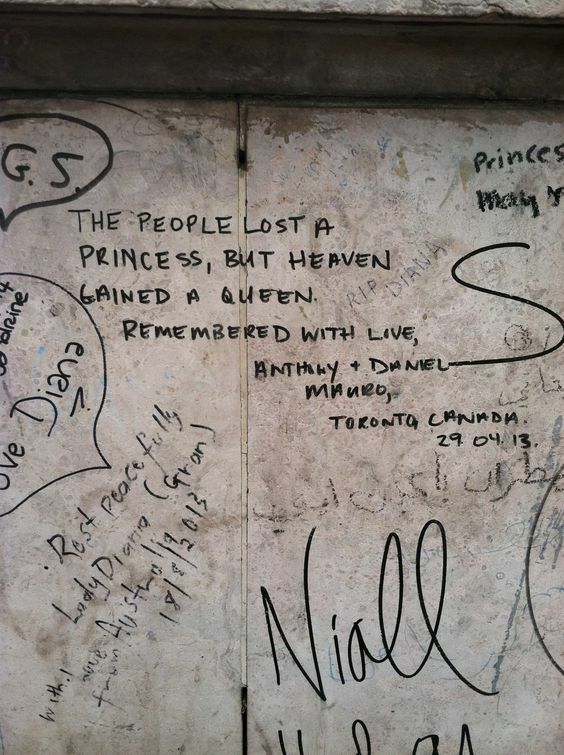 The messages on the wall were left by people from all over the world who were affected by Princess Diana. 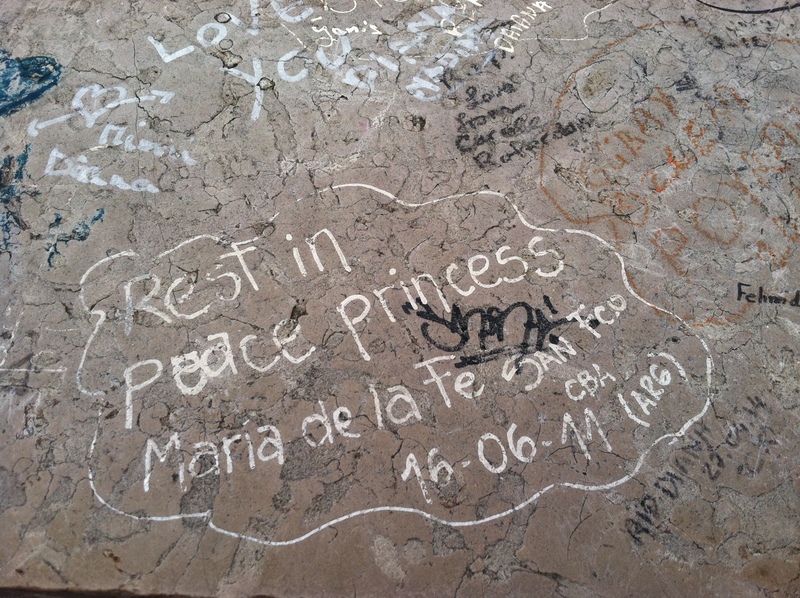 There were messages from at least 11 different countries, including the UK, Australia, Portugal, Spain, France, Iran, Brazil, Argentina, Paraguay, Canada, and the United States. 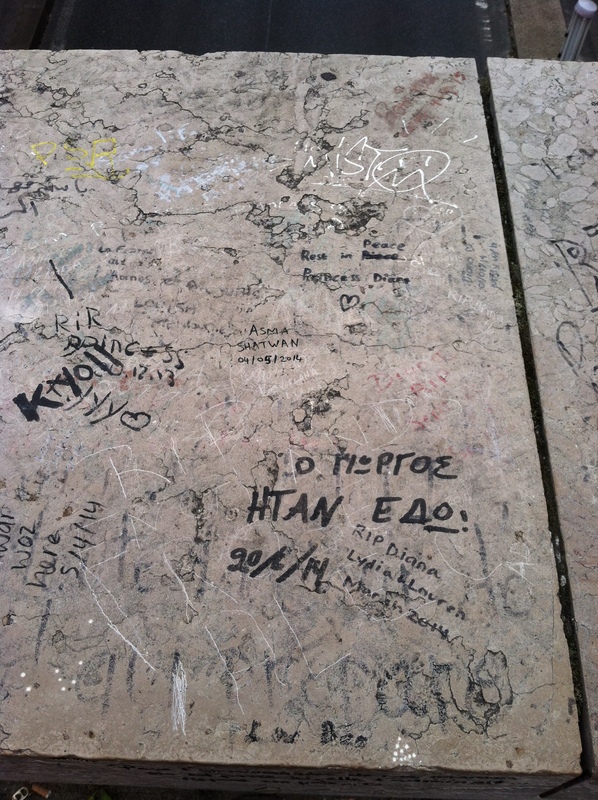 There were also at least 8 different languages written on the wall, including Spanish, English, Italian, German, French, Portuguese, Hungarian, and Greek. 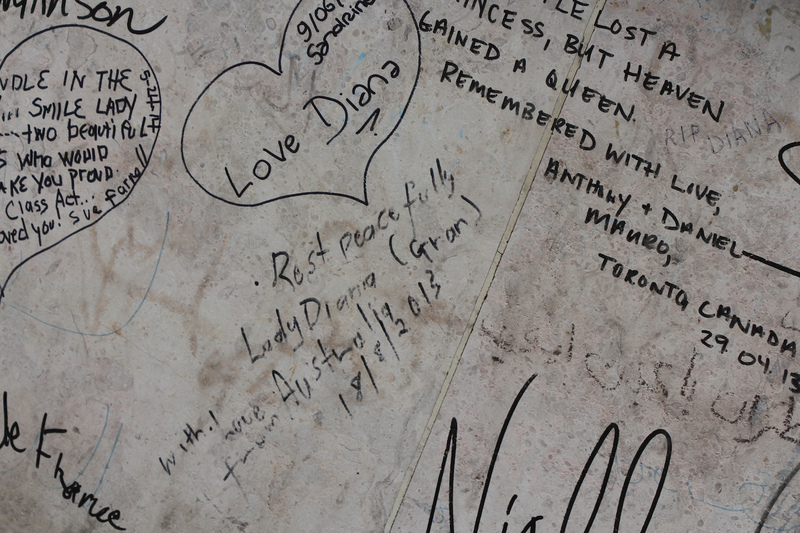 Even 17 years after her death, this physical memorial brought together people from all over the world in their dedication for Diana. 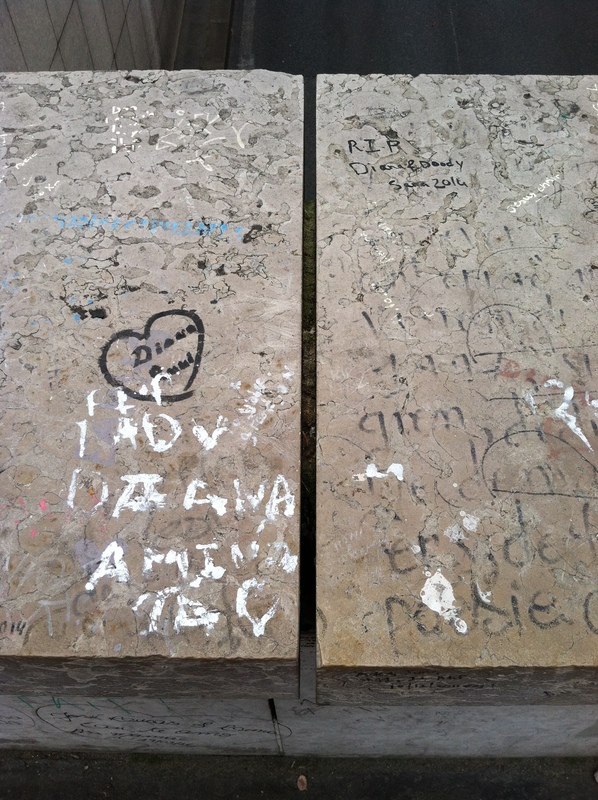 And this only represented the messages from the past month or two after older messages were removed by the city. This fact alone made the memorial remarkable. 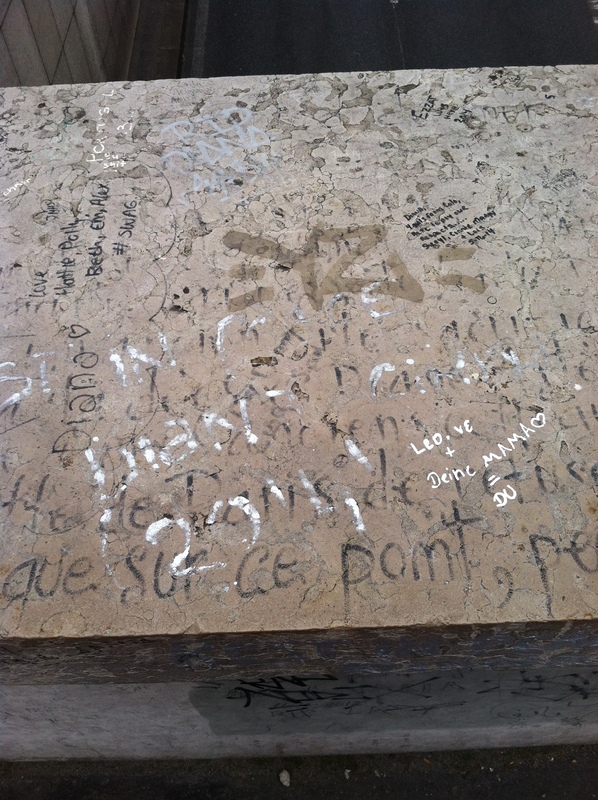 In addition, the students noticed some similarities across the written messages. 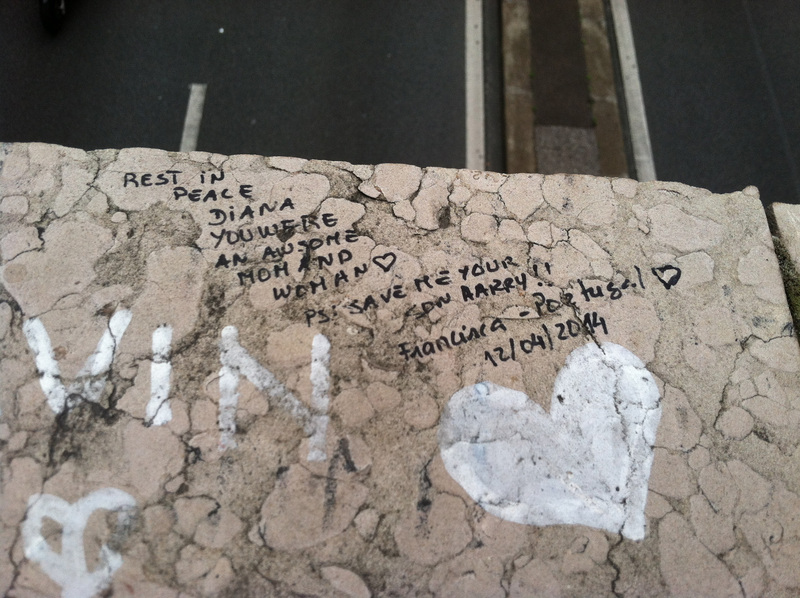 Of the 155 messages cataloged on the wall, 40 include an RIP for Diana. 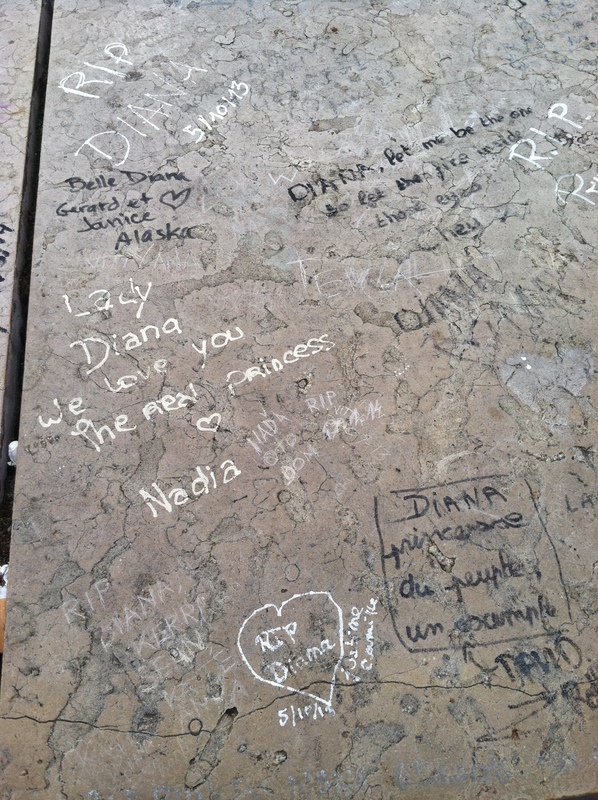 At least 19 of the messages mentioned the writer's love for and/or dedication to Diana, showing a common theme of positive remembrance for the princess. 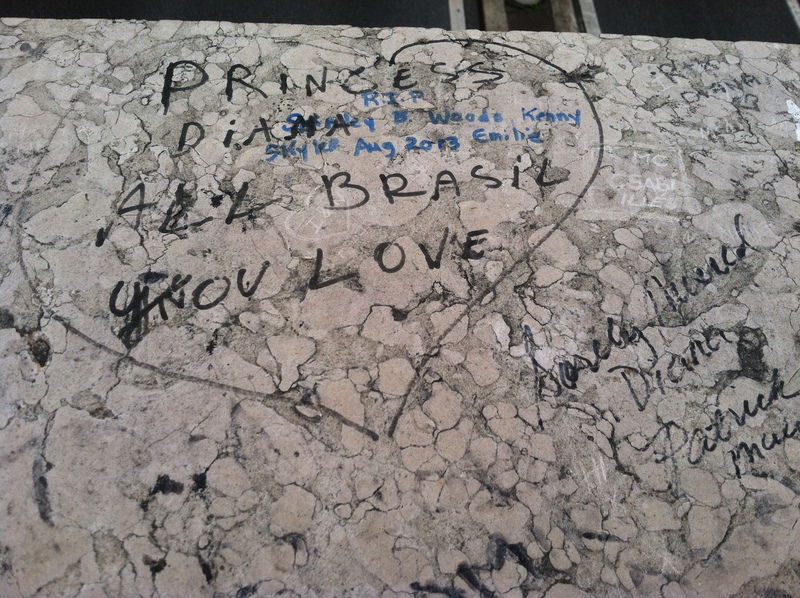 Take, for example, this message: “Lady Diana you are my princess. 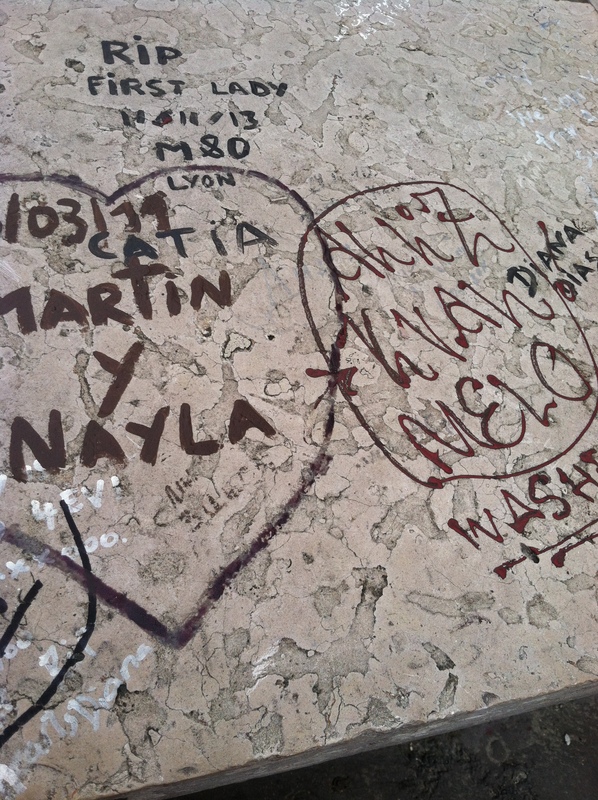 In my heart, you are forever real." 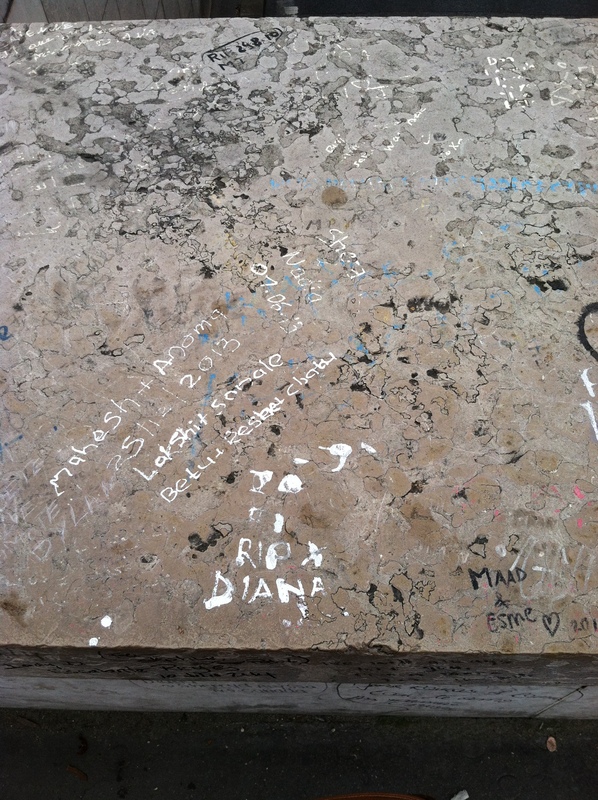 This was the case for many Diana fans- she transcended her past by living on in their present memories. 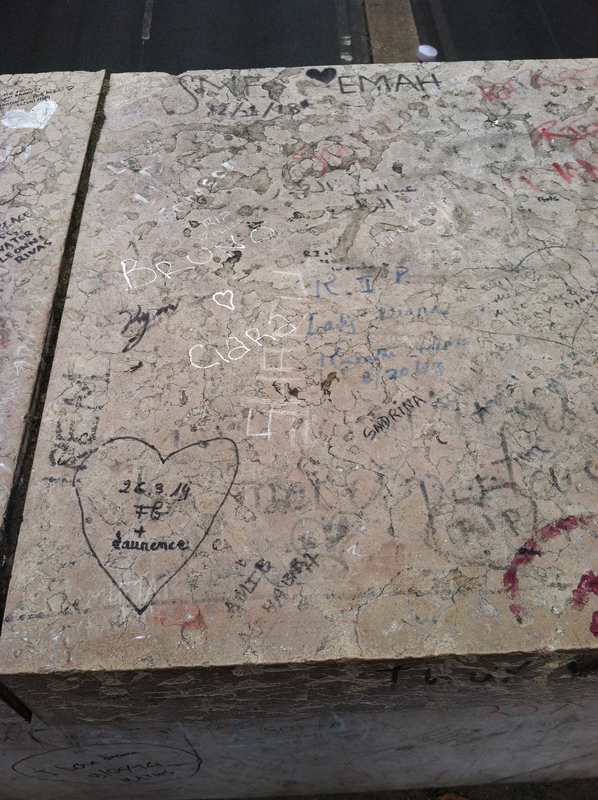 Because of this desire to make a physical memory space, similar unofficial memorials are being created. Some people even spoke of Diana as if she were a close friend: “'A candle in the wind'...smile lady Diana—two beautiful sons who would make you proud. 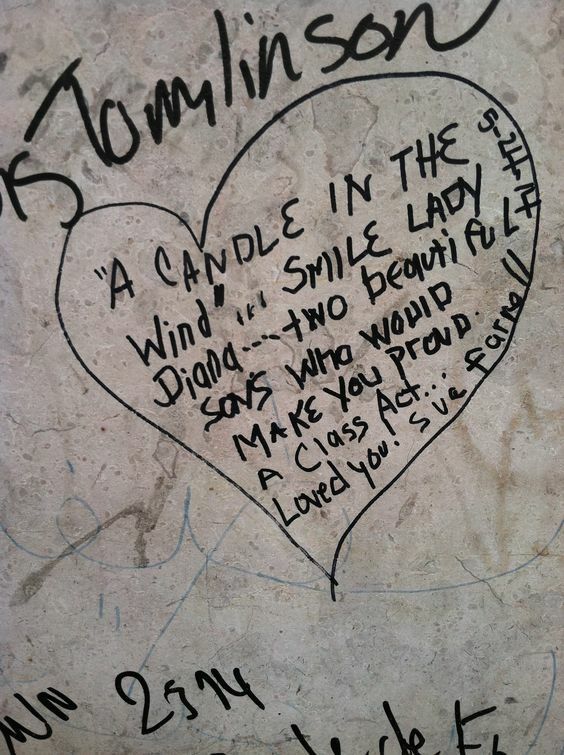 A class act...loved you!" 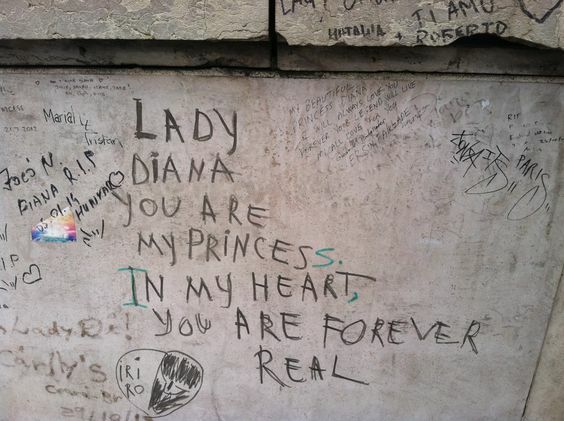 This note references the song Elton John sang at Diana's funeral. Not only did this show an in-depth knowledge of the princess, but the comment about her sons sounds very personal. 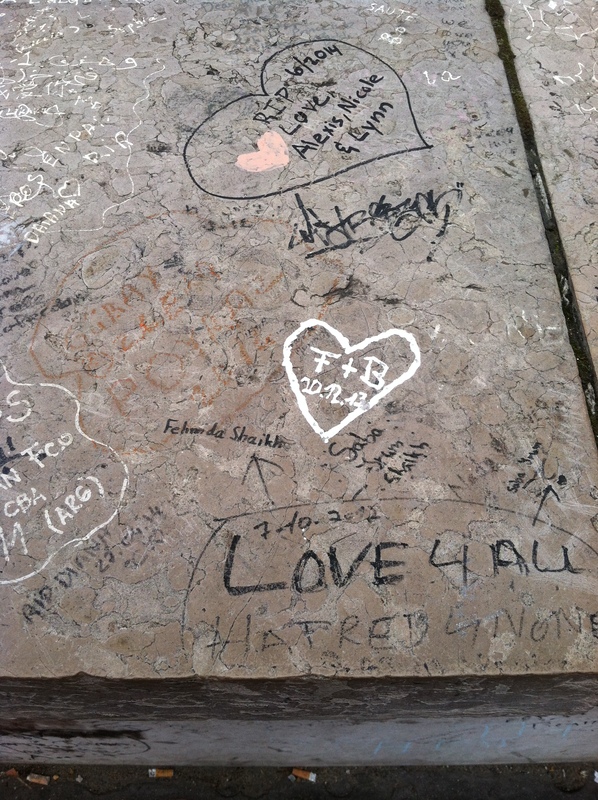 Among the messages of love and remembrance, there was also room for conspiracy. 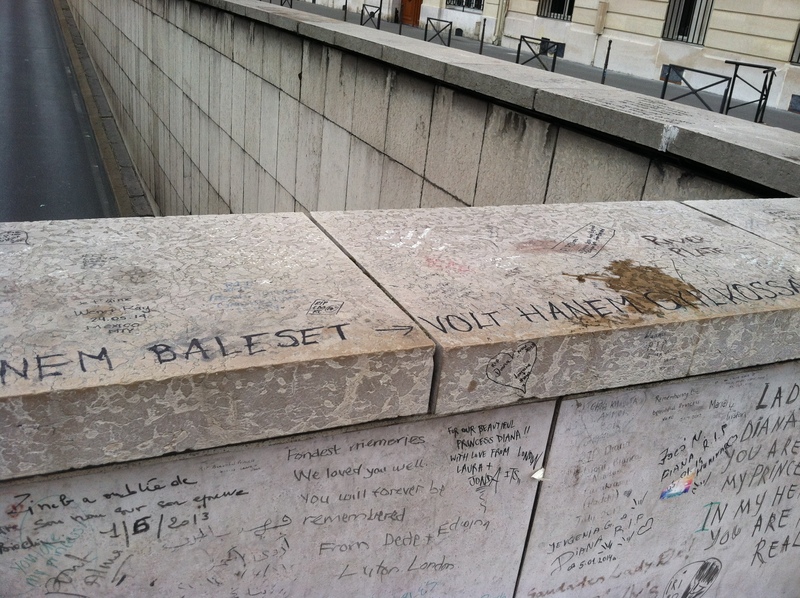 One message written in Hungarian, "Nem baleset volt hanem gyilkossag," referred to Diana and Dodi's death, stating, "It was not an accident but murder." 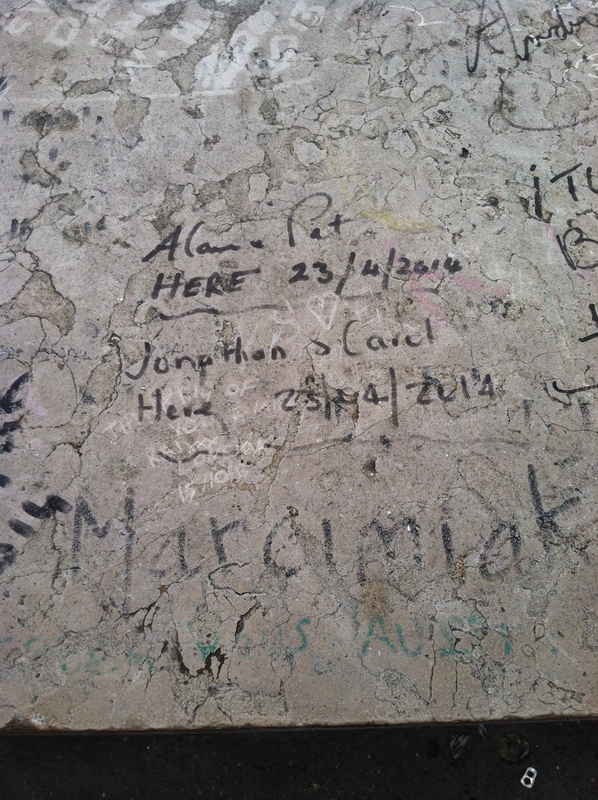 Because the memorial is unofficial and participatory, nothing is “off limits.” There is a sense of freedom in the Pont d’Alma memorial. It is, in a way, a rebellious space—a home to an unspoken battle between Paris’s need to keep order and the fans’ need to create a space of memory. 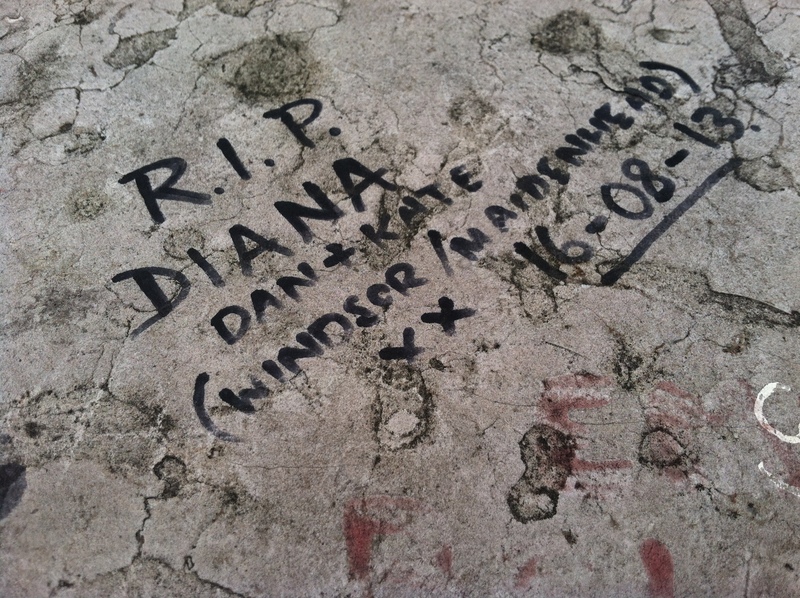 Another conspiracy message, “Fed==killer!”, referred to the belief that Diana and Dodi's deaths were planned by the British government. 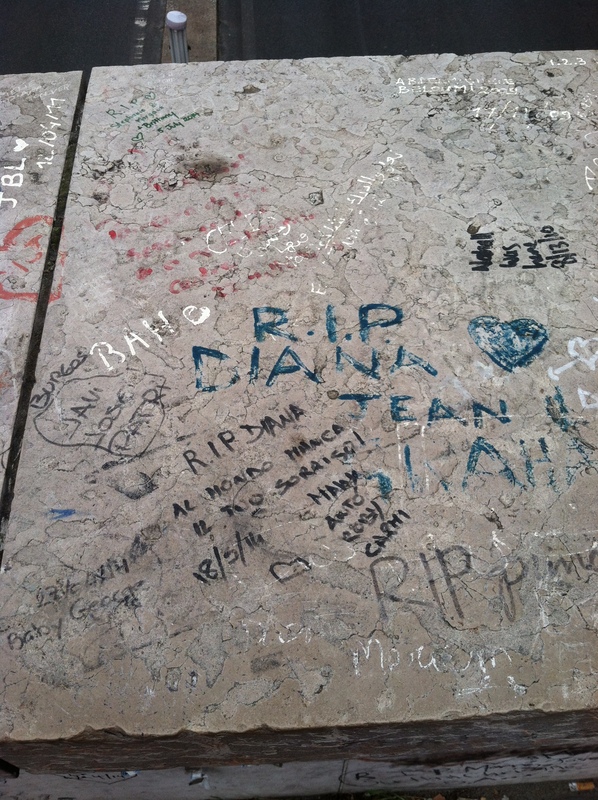 A significant portion of the messages (54 of the 156 cataloged) did not even refer to Diana. 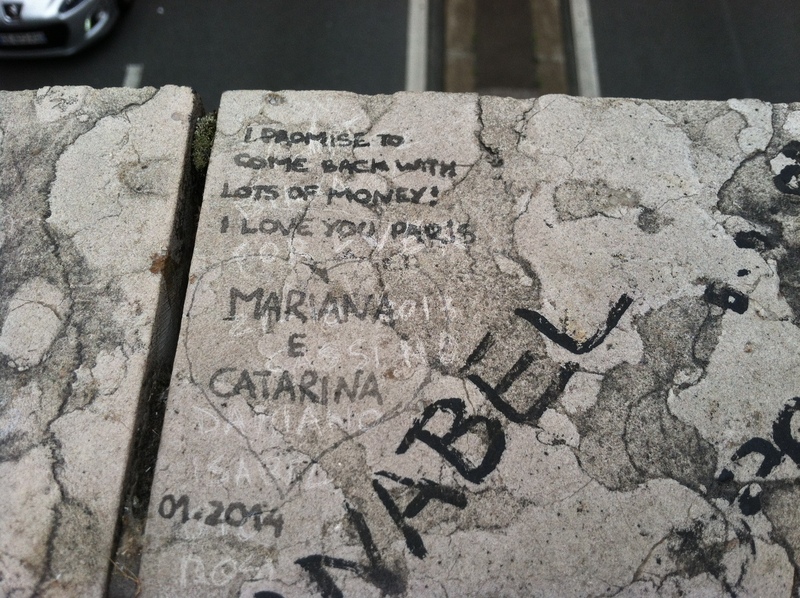 For example, this one: "I promise to come back with lots of money. 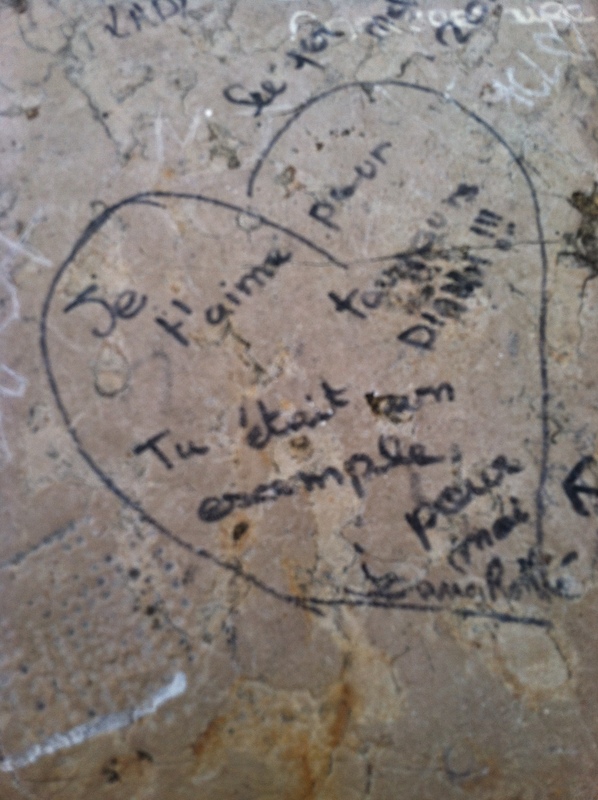 I love you Paris!" 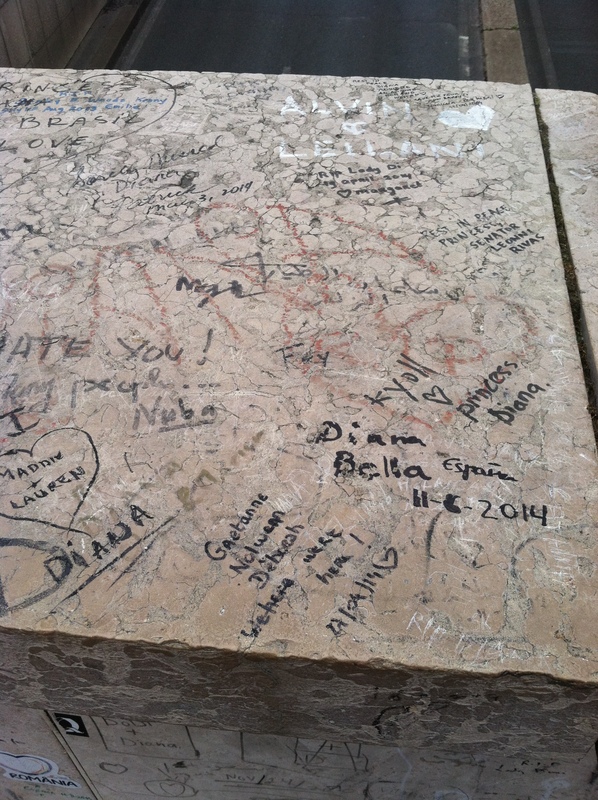 Perhaps these participants simply seek to add their mark to something they view as significant, regardless of their feelings toward Diana. 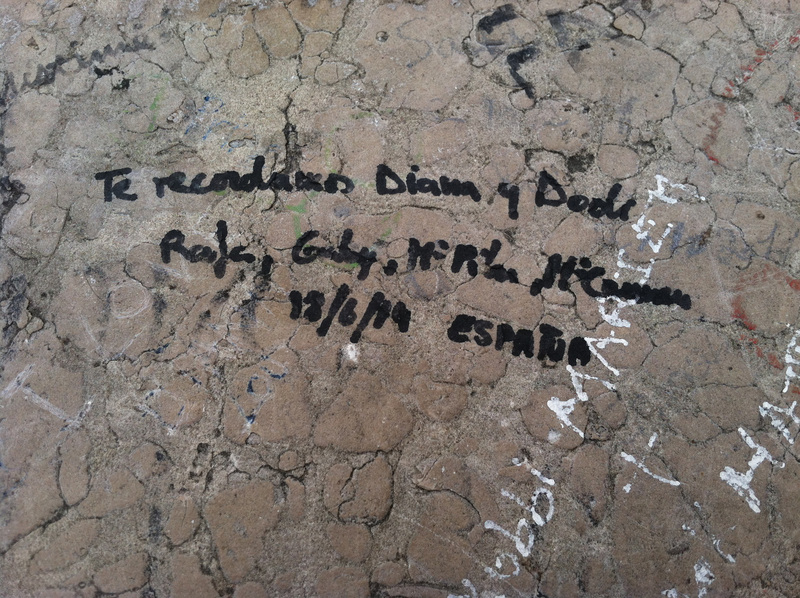 This and other data we collected allowed Liza and her undergraduate researchers to understand the kinds of experiences these participants were having in this space, including details such as where they were from, when they visited, whether they sought to honor Princess Diana or simply leave behind their own mark. This project helped the students see the connections between de Certeau’s concepts of strategies and tactics, noting how the participant’s need to have agency and the ability to write in these spaces was great. 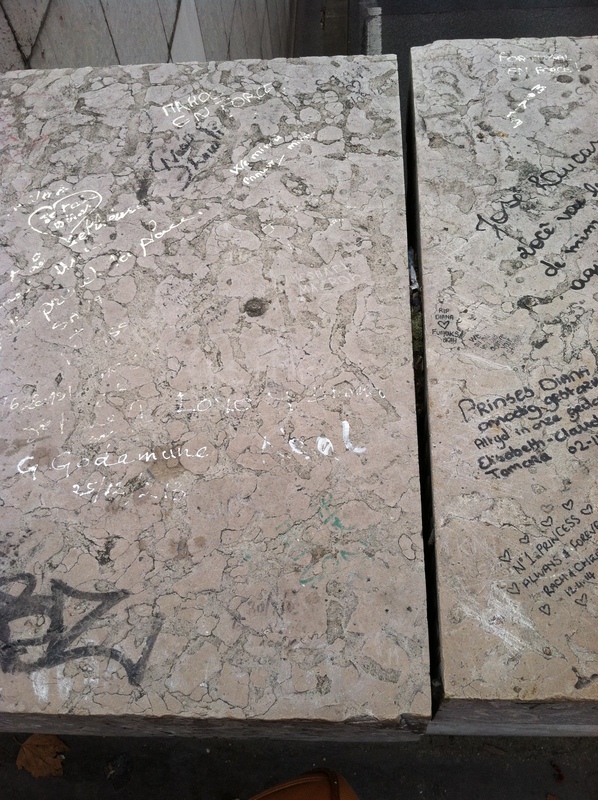 The surfaces were covered repeatedly throughout the years, in spite of how often the Parisian government tried to eliminate these memorials. 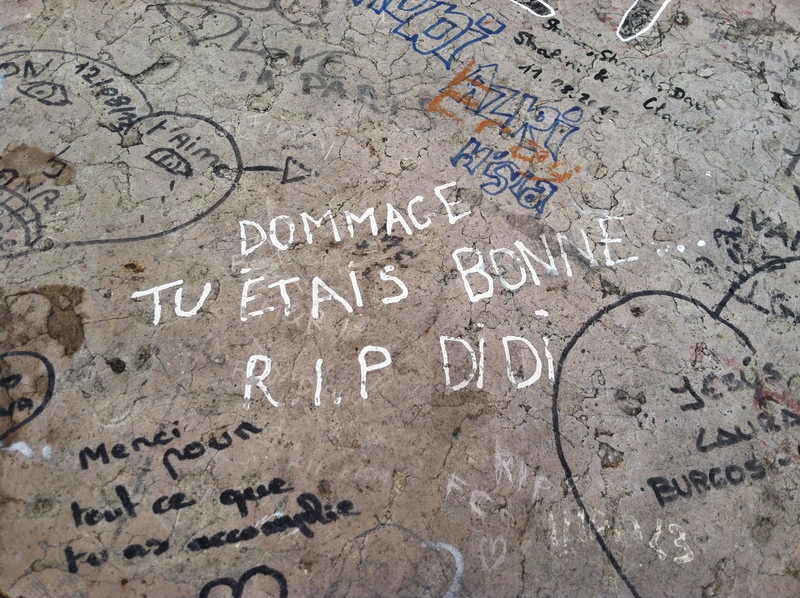 What I remember most about the memorial is 1) a large colored image of Diana with the note “Bon Anniversaire” and 2) the diversity of languages that were on the wall. 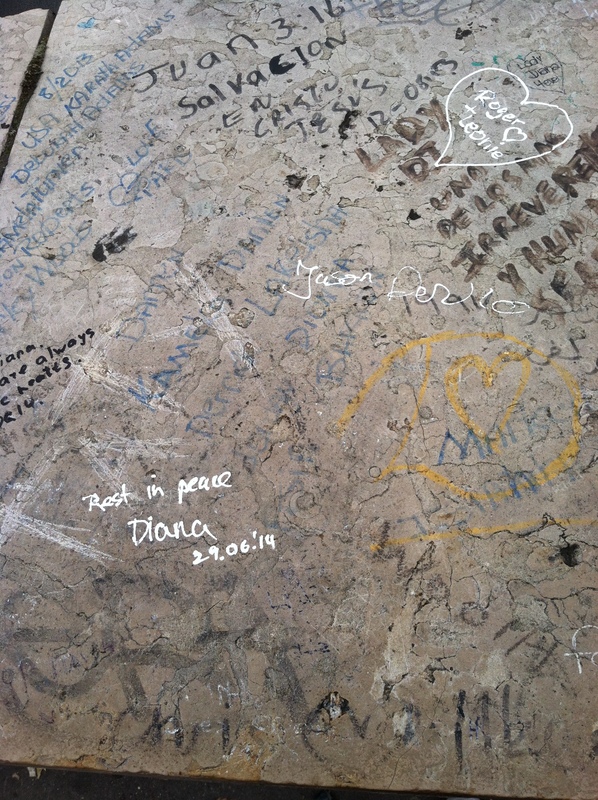 July 1, 2014 would have been Diana’s 50th birthday, and some of the messages left on the wall wished her a Happy Birthday. 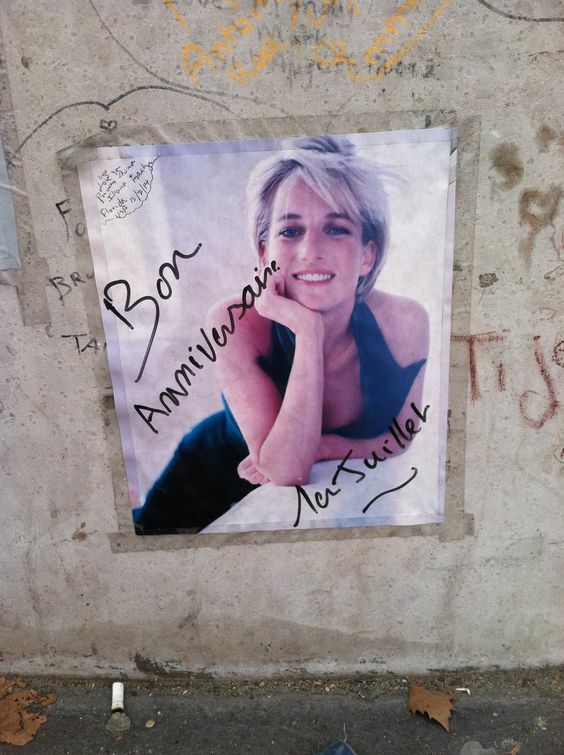 The one that stood out to me in particular featured a large image of Diana posing for a photo shoot with the message “Bon Anniversaire La Juiller” [Happy Birthday X], “We love you Princess Diana.” The visitors that left this message were prepared with momento in hand when they approached this wall; their contribution was not a casual afterthought. 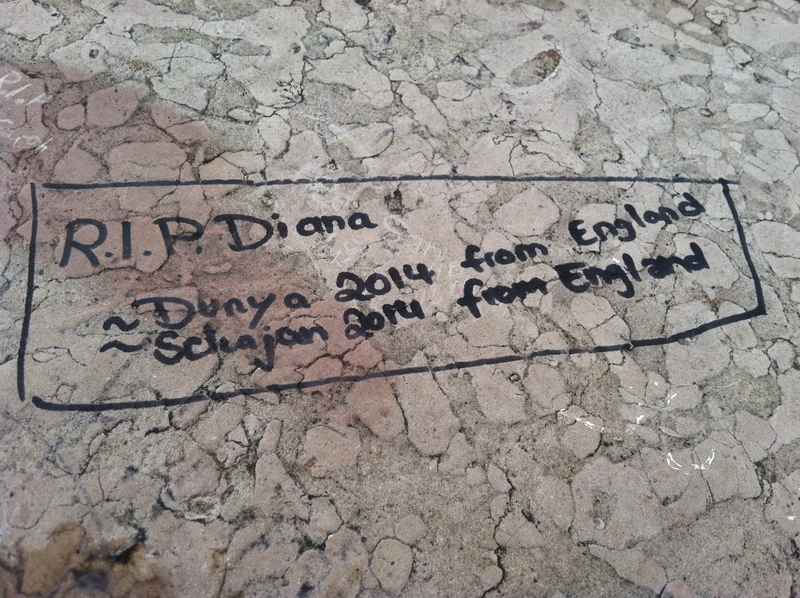 It was amazing how many different countries and languages were represented in the graffiti (based on our analysis there were at least 12 different countries represented and 9 different languages), and how many of the participants wanted to be identified as individuals (with name and country of origin), as if they felt the need to insert themselves into the Diana narrative. 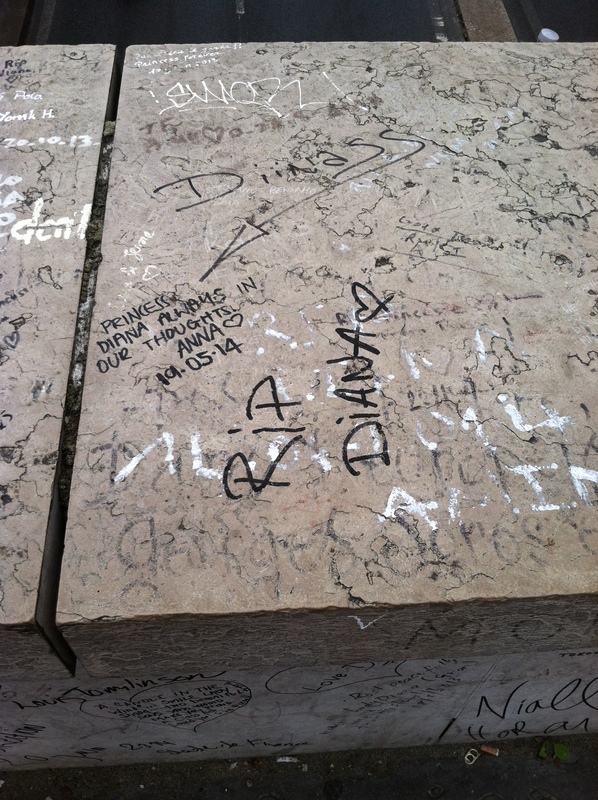 The space was created not only in dedication to Diana, but also as a way for fans to demonstrate their commitment.